Winner of the 2018 Interbike Innovations Award, the Pioneer Color GPS Cycle Computer is all new from the ground up. 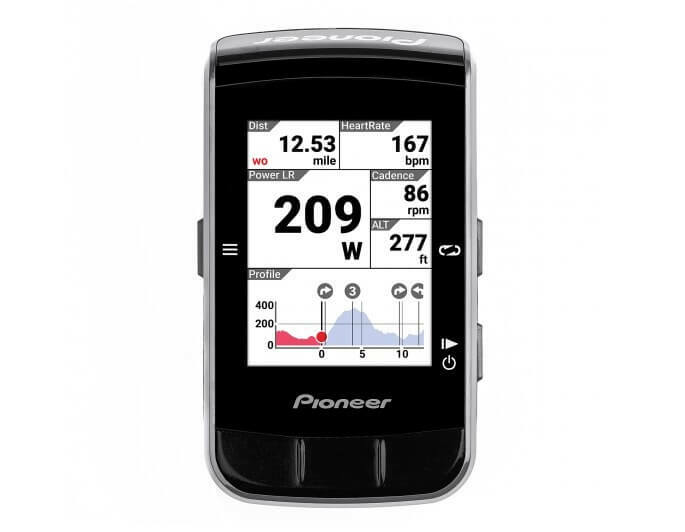 While it still has many of the standard features found in the previous version (Pioneer’s Pedaling Monitor metrics, built-in GPS, barometer and thermometer, WiFi, support of up to 6 bike profiles, etc. ), Pioneer has added a host of new innovations. Intuitive GPS navigation, Bluetooth SMART and Interval Training Assist are just a few of the new features added. The Pioneer Color GPS Cycle Computer also uses Pioneer’s proprietary Cyclo-Sphere Control App which allows for easy set-up and configuration. If Strava is your thing, it now seamlessly integrates with Strava Live Segments so you can better your PR’s. Whatever your adventure, the Pioneer computer will be there to power you with data! Designed to give you the best ride experience possible, the computer features turn-by-turn messaging, highlighted route navigation, cue sheet directions, corner scaling, route downloading from STRAVA Routes and RIDE with GPS services. 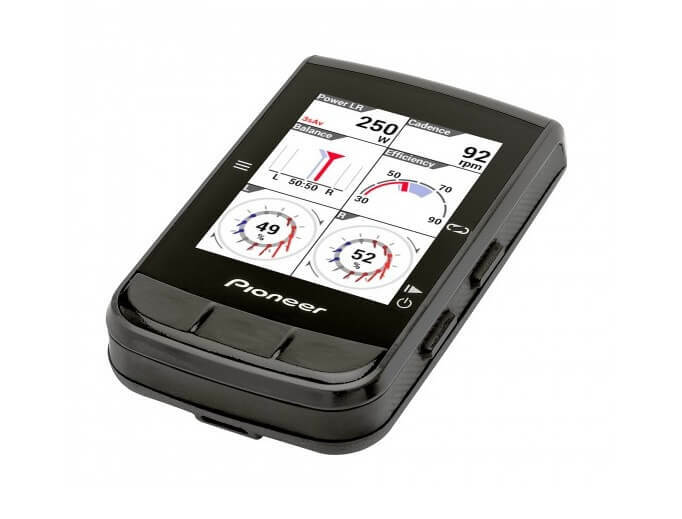 The Pioneer Color GPS Cycle Computer Connect now supports the range of wireless protocols (Bluetooth, ANT+, WIFI and FE-C), allowing you to upload your ride history and data to Pioneer’s Cyclo-Sphere app, STRAVA, Training Peaks or Today’s Plan. 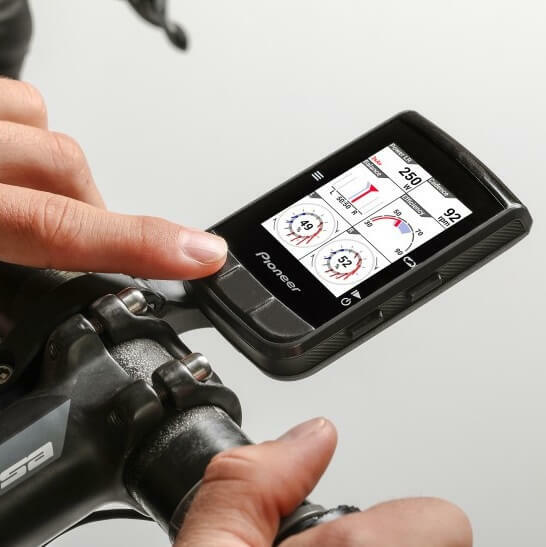 Pioneer’s advanced Pedaling Monitor displays force vector, torque vector and pedaling efficiency metrics when connected to a Pioneer power meter. There is no other computer on the market that provides this data. Pioneer’s proprietary Cyclo-Sphere Control App allows for easy and intuitive set-up and configuration, as well as updating of your computer’s firmware. The Pioneer Color GPS Cycle Computer comes standard with three options for interval training: Pioneer Training Assist, Training Peaks and manual. These features allow you to conduct customized intervals based on your personalized FTP.